A woman dressed in a heavy, multi-layered skirt delivers a series of overpowering slaps to her opponent before dragging her across the ring by her long braids. She then spits water on her face before smashing the bottle on her head. The audience boos and jeers, while the referee intentionally looks away. Suddenly, the victim makes a surprising flip and pins the villainous wrestler down. The referee counts to three, and the commentator announces the triumph of good over bad. The audience bursts into cheers and applause! 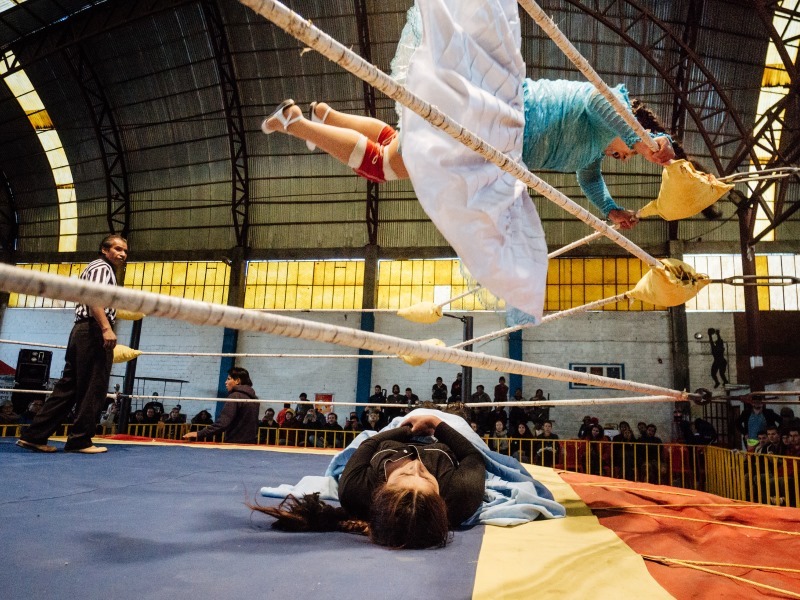 They are the Fighting Cholitas, a group of woman wrestlers in Bolivia, who fight twice a week in El Alto in front of hundreds of spectators. To a casual visitor, the fights may appear to be just another scripted gimmick, but the roots of this fascinating combat run deep. 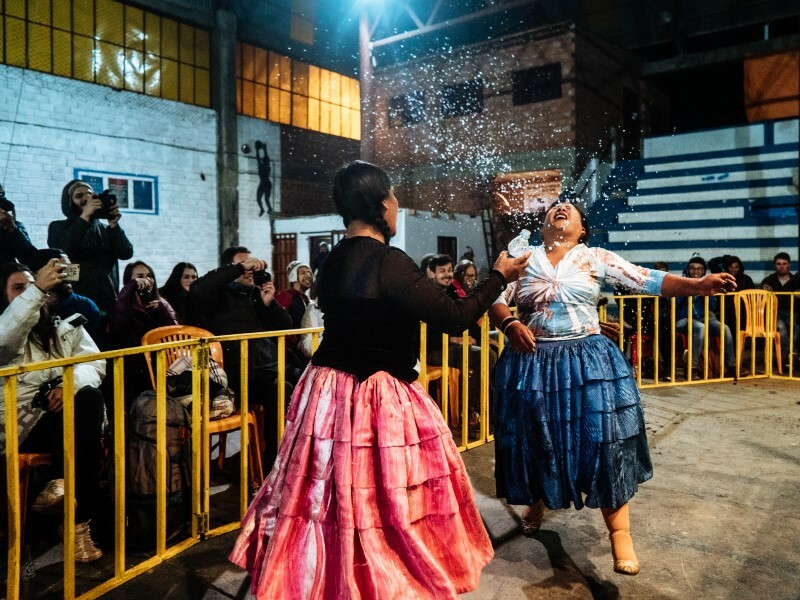 Oppressed for centuries by their fellow Bolivians, these women are avenging themselves in a class-based, male-dominant society to reclaim the respect that they deserve. In the El Alto colosseum, roughly 13,000ft (4,000m) above sea level, in the hills above La Paz, the commentator announces the next fight. 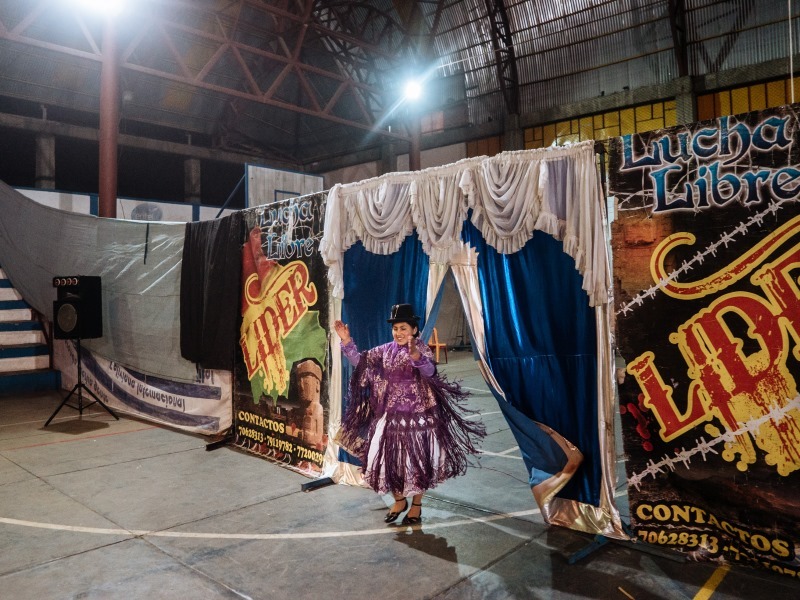 Loudspeakers blast Andean dance music at an ear-piercing volume. Smiling Cholitas in colourful pollera skirts, bowler hats, and fringed shawls make a dramatic entrance. They dance and circle around in front of the spectators who cheer and clap for them. The music stops, and the air around the hexagonal ring becomes tense. The Cholitas take off their hats, shawls, and jewelry and put them aside. Their once-smiling faces now scowl in anger and disgust; eyebrows squeezed and fists clenched. The musty arena is deathly silent. Jaws crunching popcorn in the front row suddenly stop moving. All eyes are on the women inside the ring. The fight is about to begin! The word Cholita comes from the Spanish word cholo (chola for females) meaning mixed-race. It refers to people with one Amerindian parent and one second-generation Spanish parent. The diminutive “ita” in Spanish indicates “small,” and is used affectionately. When Spanish colonialists first arrived in South America, they introduced a complex caste system that ranked people according to color and race in order to maintain dominance. In this caste system, Cholos ranked as the lower middle class and were discriminated against for centuries. As women from a socially marginalized community, the Cholitas have faced not just social, economic, and political challenges but also gender discrimination. But they haven’t given up. 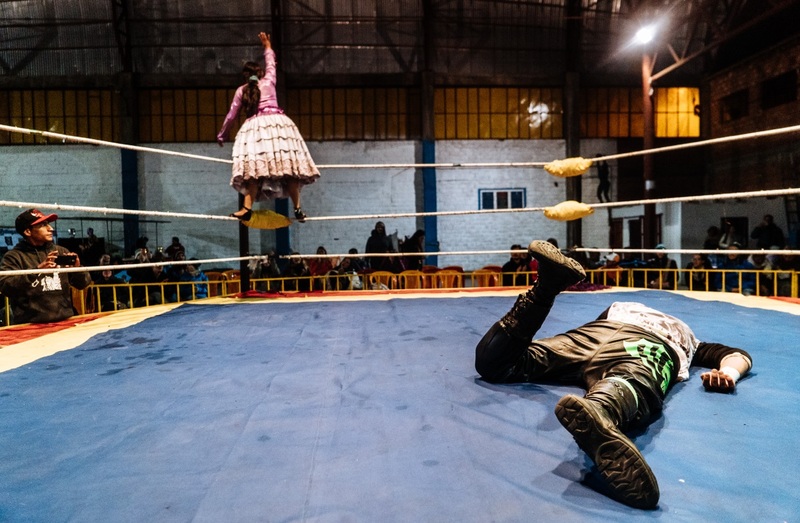 A group of Cholita fighters is now setting a new example for their community by resisting the patriarchy both inside and outside the ring. 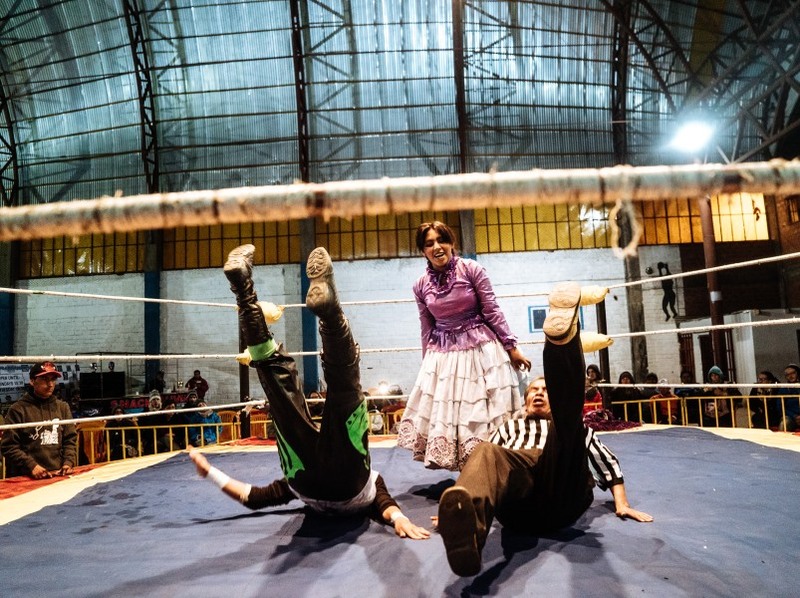 When the wrestling organizers in El Alto introduced women wrestlers as a marketing ploy to build their audiences, Cholitas jumped at the opportunity. This was more than a chance to earn – it was a chance to prove their strength and bravado. The Fighting Cholitas in their elaborate attire became an instant hit. They formed an independent association, and now they manage their own fights. 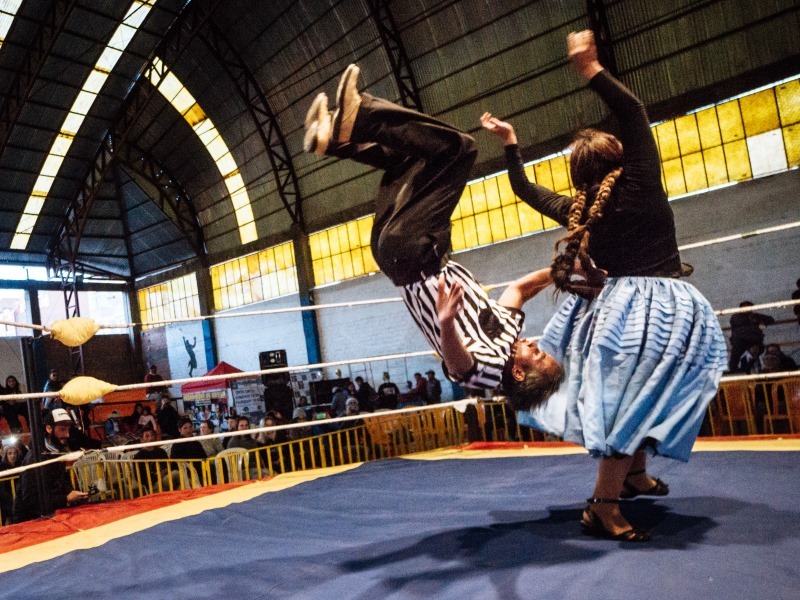 The Cholitas way of wrestling is called Lucha Libre (free fighting). It’s known for free-style combat and aerial acrobatic moves that execute a good-versus-evil fight, with a dramatic story line. One wrestler plays the role of a bad guy – the nasty antagonist who uses unfair means in their attempts to win the fight. The opponent plays the good guy – the protagonist who is polite, follows the rules, and uses elegant and highly technical moves to counter their opponents. The good guy wins the support of the audience, who cheers them on in the match, while the bad guy is often helped by the referee, who willfully ignores the unfair moves and tactics. As with most popular tales, the good always wins over the bad, leaving the audience satisfied that justice has been done. It takes about a year of training for a Cholita to become a luchadora (fighter). A fighter can be anywhere between 16 and 70 years old and earns about US$20-25 for one fight. Although the fight is scripted, the moves and falls are real. Sometimes wrestlers are seriously injured and have to spend days in the hospital at their own expense. So most Cholitas have other jobs, aside from their wrestling careers. 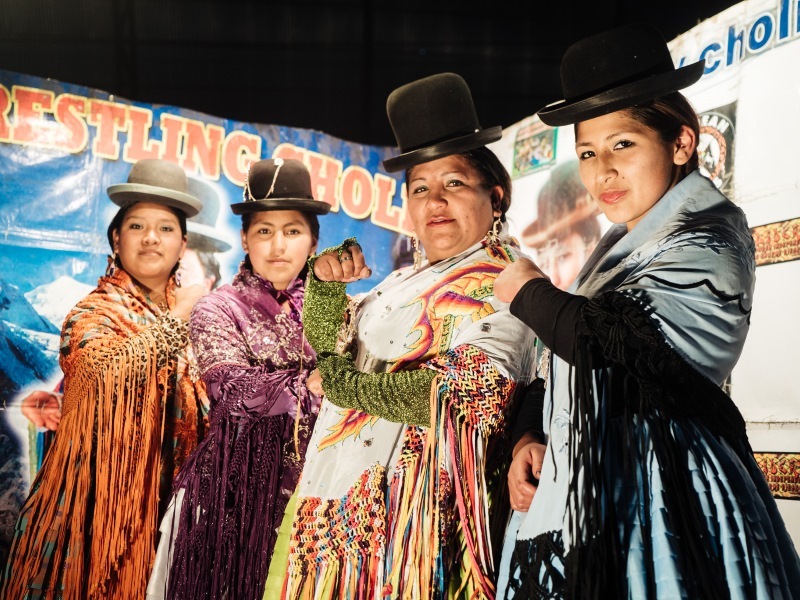 Unlike the WWF women wrestlers who wear tight, revealing garments, the Cholitas prefer to wear the same costume inside the ring that they wear outside. Their dress consists of a pollera (high-waisted, multi-layered) skirt, an embroidered shawl, braided hair, a bowler hat, and ballet shoes. Though this garb was enforced upon the Aymara population by the Spanish in the 18th century, as a way of caste classification, the distinctive pollera dress is now a symbol of the Aymara identity, and the Cholitas take pride in it. The figure-concealing dress embodies modesty, an important trait in the Bolivian culture. 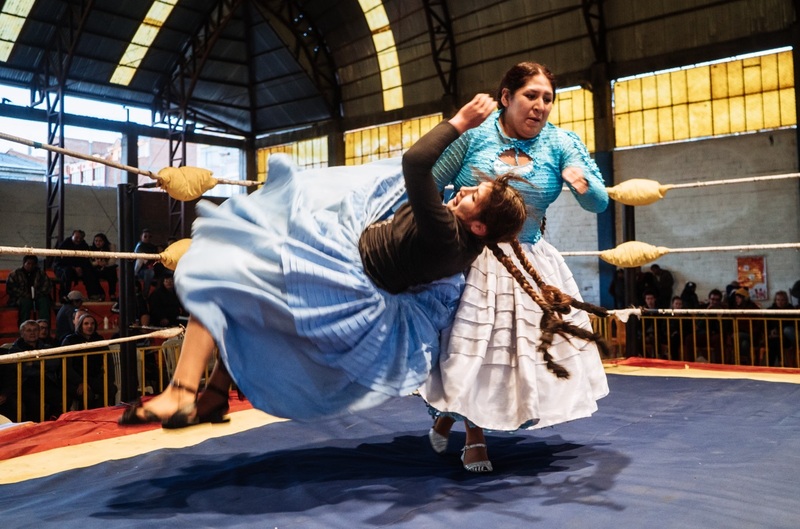 For the Cholitas, wrestling in a ladylike dress is also a statement: women do not have to compromise on their identity to compete with men. Their unusual fighting attire captures attention – their femininity makes the spectators marvel at their strength. But the wrestling Cholitas are not about appearances. In fact, their fight is not really about the wrestling match inside the ring at all. The Cholitas have now become a visual symbol of Bolivia. They have attained celebrity status, with documentaries, calendars, photo essays, and even music videos featuring them. And even though their pay is still low, they are finding their way into universities and better-paying jobs. Their fight is a statement – against social and gender discrimination, exotification, and objectification. Although things are looking up, they continue to fight to show that when justice is not served, it has to be fought for. When I arrived in La Paz, during my bicycle journey through South America, I noticed a poster advertising the Fighting Cholitas in a tourism office. It immediately caught my attention. As I learned more about the Cholitas, I became fascinated by their unique story and desperately wanted to document it. The indigenous Aymara people are a very reserved community and are suspicious of strangers. They don't welcome photography. 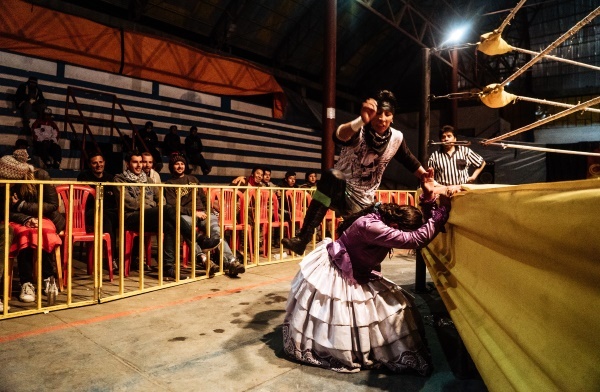 So to see these Cholitas women wrestling in front of hundreds of strangers and posing for the camera at the end of the show was a pleasant surprise. 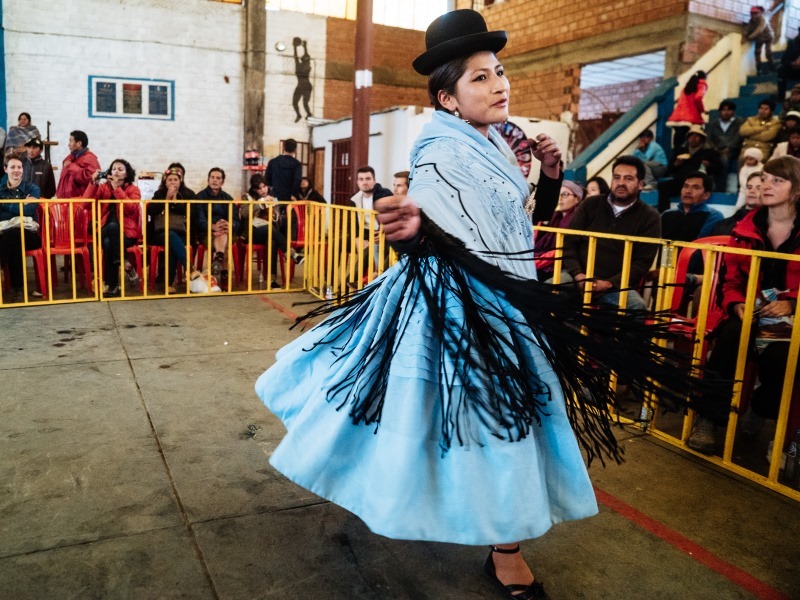 I spent a few weeks in La Paz learning more about the Cholitas and their way of life, but it was a constant struggle to try and win their trust. 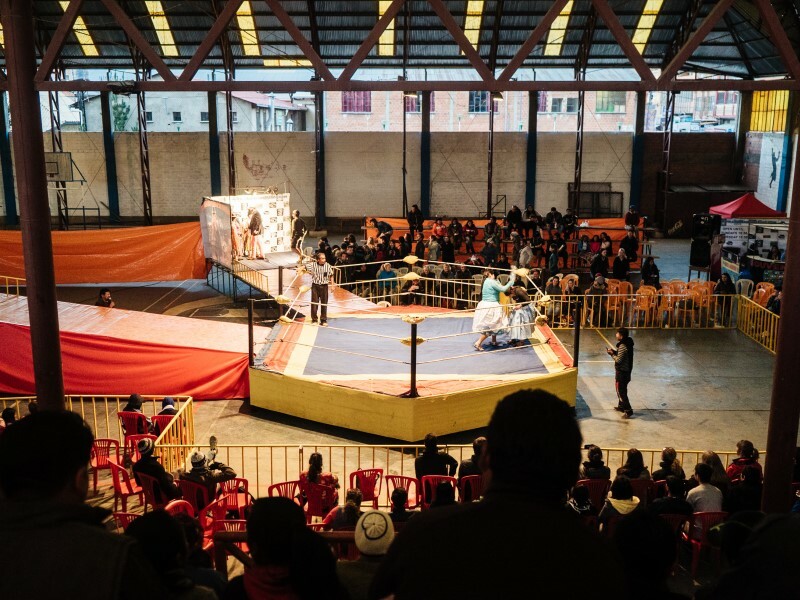 They welcomed me to the arena and were happy to be photographed during and after the wrestling matches, but they did not want to talk much about their personal lives. I am a cyclist and photographer, born and raised in Pakistan and currently on a 3-year, 30,000-km bicycle journey from Argentina to Alaska. Andrés Brenner learns why the locals in Peru’s Sacred Valley choose to keep the ancient ways. Unlike any other place on earth, this place is impossible to describe. Bolivia can only be understood by experience. Barren salt flats, steamy jungles and soaring mountain peaks, Bolivia is wild and diverse. Find out how to stay healthy while enjoying the beauty with these tips. Wonderful to read of the Cholitas empowerment and advancement; thanks for sharing your story.